1977년 봄, 청원군 석병산에 있는 채무이와 그의 부인 묘를 이장하게 되었을 때 관에서 나온 것으로 의복과 당시 채씨 집안에 오고간 서간류이다. 채무이(1537∼1594)는 명종 10년(1555) 생원을 시작으로 세자 익위사대직을 지낸 인물로 그는 임진왜란 중인 선조27년(1594)에 죽었고 그의 둘째 부인인 김씨는 임진왜란 전에 죽은 것으로 보여 이곳에서 출토된 의복과 서간류는 임진왜란 전의 유물로 분류되고 있다. 의복은 김씨 부인이 평소에 착용하였던 것으로 겹누비철릭 1점, 겹누비바지 2점, 겹회장저고리 2점, 직령 겹두루마기 1점, 목면 겹저고리 1점, 모시 치마 1점, 베적삼 1점, 모시철릭 1점, 토시 1점 등이 있는데 그 내용은 다음과 같다. 모시철릭은 흰색의 세모시로 된 겉옷으로 치수는 등솔기에서 소매끝까지의 화장길이 144㎝, 뒤품 40㎝, 소매길이 104㎝이다. 치마는 길이 63㎝에 2㎜의 잔주름이 있으며 겉자락 6폭, 뒷자락 7폭, 안자락 2폭으로 총 15폭으로 만들어진 특이한 치마이다. 잔주름은 눌러 덧 박았는데 그 박음질 솜씨가 매우 섬세하다. 토시 1점은 겉은 가는 명주이고 안은 굵은 명주이며 속에는 얇게 솜을 넣었다. 크기는 52㎝ ×39㎝로 비교적 큰 편이며 양쪽 부리에는 1㎝간격으로 곱게 선을 대었다. 철릭은 조선시대 문무관리들이 외국에 사신으로 파견되거나, 국난을 당했을 때, 왕을 호위할 때 착용했던 옷으로 소매가 넓고 웃옷과 치마가 연결되어 있으며 허리에 주름이 있는 옷이다. 웃옷인 저고리는 몽땅하고 겨드랑이에 다른 천을 댄 무가 있으며 저고리 소매 뒤의 회장과 소매끝에 덧댄 천인 삼수가 상당히 넓다. 깃은 겹깃으로 고색(古色)을 띠고 있는데, 신라와 고려의 저고리를 상고하는데 도움이 되고있다. 저고리와 연결된 치마의 주름은 잔주름으로 되어있고 조선 초기의 포로서 깃모양이 직각으로 각진 직령이다. 특히 여기서 주목할만한 점은 여자도 철릭을 입었다는 사실과 철릭의 초기모습을 보여주는 것으로 복식사연구에 귀중한 자료가 되고 있다. 이밖에도 만장 3점, 은장도, 돗자리, 목관, 표주박 1점, 185점이 함께 출토되었는데, 특히 언간문은 16세기 언어 연구에 중요한 자료가 되고 있다. When the tombs of Chae Mu-yi (1537~ 1594) and his wife were moved from Seokbyeongsan Mountain in Cheongwon-gun in the spring of 1977, these clothes and letters were excavated. He began his career as a public officer in the 10th year of the reign of King Myeongjong (1555). He died in the 27th year of King Seonjo’s reign (1594), during the Japanese Invasion of Korea in 1592. His second wife died before the war. The artifacts are estimated to have been made before the Japanese Invasion. The excavated clothes are assumed to have been worn by his wife. They consist of a double-layered robe, 2 pieces of quilted lined trousers, 2 lined hoejang jeogori (jacket with colorful cloth decoration), lined durumagi (Korean topcoat), cotton cloth-lined jeogori (jacket), a ramie fabric skirt, hemp jeoksam (an unlined summer jacket), ramie cheollik (official robe), and a piece of tosi (wrist warmer). 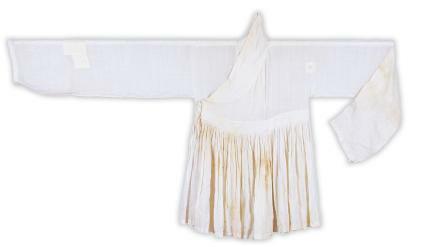 A ramie Cheollik is an outer garment made of white ramie cloth with fine texture. Hwajang (length from the back seam to the end of one sleeve) is 144 cm long; the back is 40 long, and the sleeve is 104cm long. The skirt has 2 millimeters of fine pleats 63 cm long. It consists of a total of 15 pok (width of joined parts in a skirt) including 6 pok from the outer skirt, 7 pok from the back of the skirt, and 2-pok lined skirt. The pressed fine pleats were sewn twice, and the sewing is very elaborate. 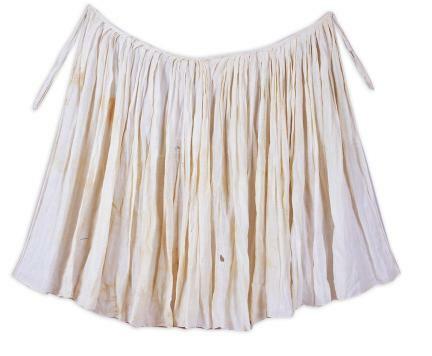 The outer side of the excavated tosi is made of fine silk, but its lining is made of coarse silk. Thinly padded with cotton wool inside, it is relatively large at 52 cm wide and 39 cm long. The tosi is decorated with lines at an interval of 1cm. The cheollik was worn by civil and military officials when they were sent to a foreign country as an envoy, when they escorted the King, or during a national crisis. It has wide sleeves and pleats on the waist. The jacket and skirt parts are connected together. Jeogori is rather short, with a mu (gusset insertion) attached under each armpit. 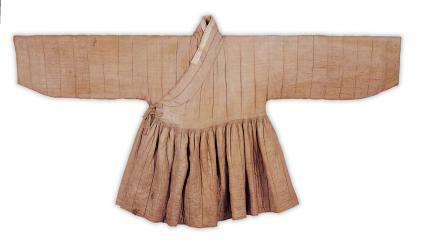 The hoejang (colorful cloth insertion) attached to the back of the sleeves and the samsu (cloth) attached to the end of the sleeves are quite wide. It has a double collar in elegant color. The style is very useful in studying the jeogori of the Silla and Goryeo dynasties. 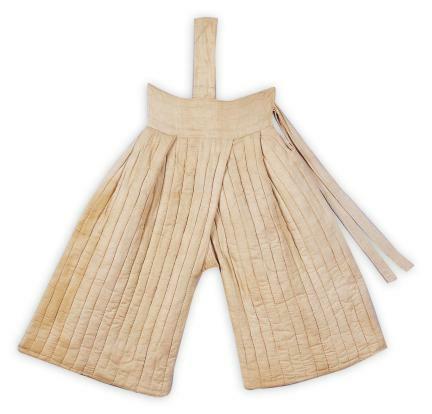 The pleats of the skirt connected to the jeogori are very thin, and the shape of the collar in the early Joseon period is made in a perpendicular angle. What is remarkable about this is that women also wore cheollik. From the graves, some 185 additional artifacts were excavated including three pieces of manjang (funeral elegy), a silver-decorated knife, a mat, a wooden coffin, and a small gourd bowl. 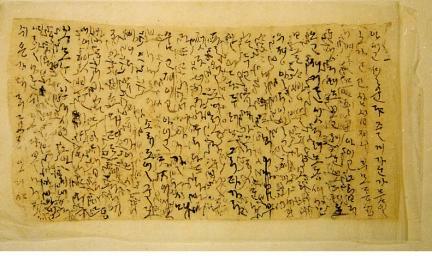 In particular, the Korean letters written in those documents are considered valuable material in studying the language of the 16th century.